Provial Fair 2012 was a fruitful instance of exchange and interaction between the private and public sectors, as well as researchers and suppliers of development of road infrastructure products and services. That made it the ideal setting to share knowledge in this matter. Tecnovial, a specialized in the development of road infrastructure solutions company, presented the results of a study that aims to improve practical aspects of road safety in Chile. The Thrie-Beam Traffic Barrier of the Highways Handbook (MC) is classified as a medium-high containment system. However, numerical evaluations conducted in LS-Dyna show that with minor modifications this kind of traffic barrier can achieve a high level of containment. Through a technical presentation in the New Technologies module, Tecnovial made a contribution to the knowledge of national containment systems in an objective and experimental manner. The presentation focused on the results obtained from the performance evaluation of the thrie-beam barrier of the Highways Handbook. This study is part of an ambitious program of innovation and development being conducted by the company. 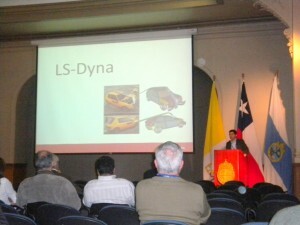 The presentation by the Tecnovial Head of Engineering and Development Ramiro Villagra, showed that it is possible to obtain more benefits from Thrie-Beam Traffic Barrier just by making minor modifications to the structure in order to increase its level of containment and, therefore, the safety of roads with virtually no impact on the costs of the solution. With this study, Tecnovial sets a precedent that surely has a number of benefits for the country in the field of road safety. You can download the study in here.